How Much Solidarity with Iran can the China-led SCO afford? 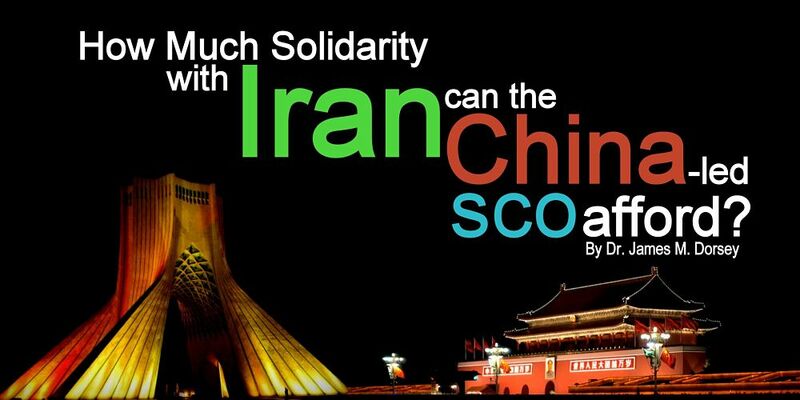 Home / China / Energy Politics / Geo Politics / Iran / Opinion / SCO / How Much Solidarity with Iran can the China-led SCO afford? A planned China and Russia-led show of support for Iran at next month’s Shanghai Cooperation Organization (SCO) summit is likely to be primarily symbolic unless the group opts to honor the Islamic republic’s bid to be upgraded from observer to full member. Yet, even a symbolic SCO gesture at its June 9-10 gathering in the Chinese city of Qingdao that would denounce the U.S. withdrawal from the 2015 international nuclear agreement with Iran and imposition of harsh sanctions could prove tricky. The meeting is expected to be attended by the presidents of China, Russia, Iran India, Pakistan, Kazakhstan, Kyrgyzstan, Uzbekistan, and Tajikistan. It will come a day after the leaders of G-7 that groups the United States, the European Union, Japan, Canada, Britain, France, and Germany are unlikely to find common ground on Iran at their summit in Quebec. China and Russia, like Europe, are signatories of the nuclear agreement, but less concerned than Britain, France, and Germany about the threat of US sanctions against their own companies who do business in Iran. At least officially, they have so far not factored in a potential Saudi and UAE response to efforts to defeat the sanctions and salvage the agreement. As a result, Chinese and Russian state-backed companies are maneuvering to profit from European firms like French oil company Total that are leaving Iran in the belief that the European Union will not be able to shield them from US retaliation. Swiss lender Banque de Commerce et de Placements (BCP) said on Tuesday that it had suspended new transactions with Iran and was winding down Iran-related activities. Earlier, Germany's second-biggest lender, DZ Bank, said it would halt financial transactions with Iran in July. For its part, India, despite being dependent on energy from the Gulf, has vowed to keep trading with Iran irrespective of the fallout from US sanctions. "India follows only UN sanctions and not unilateral sanctions by any country," said Indian Foreign Minister Sushma Swaraj. Pakistan could find itself in the most difficult situation given its close political, military and cultural ties to Saudi Arabia and the UAE and its 700-kilometer long border with Iran. So far, the Trump administration appears to see the economic pressure that would fuel already widespread discontent in Iran as its best bet. That could change however if efforts by SCO members as well as Europe succeed in countering US sanctions and salvaging the nuclear deal. The group, believed to be responsible for the killing of several American military personnel and contractors in Iran in the 1970s, was designated by the U.S. Treasury in 1997 and delisted in 2012, a year after a host of former US and British officials, came out publicly in support of the group. Many of the officials have attended and addressed MEK rallies, allegedly in exchange for handsome fees and all-expenses-paid trip. MEK, which first gained recognition for its opposition to the Shah of Iran, has denied paying for speaking engagements. "The declared policy of the United States of America should be the overthrow of the mullah’s regime in Iran. Before 2019, we here will celebrate in Tehran," Mr. Bolton told an MEK rally less than a year before his appointment by Mr. Trump. "The regime is evil, and it must go. Free Iran," added Mr. Giuliani. A Syrian opposition news website reported this week that Saudi Arabia was funding and providing logistical support to the U.S.-backed Democratic Union Party (PYD), a battle-hardened Syrian Kurdish group that has proven its mettle in fighting the Islamic State. "Your legitimate struggle against the (Iranian) regime will achieve its goal, sooner or later. I, too, want the fall of the regime," Prince Turki, echoing the statements by Messrs. Bolton and Giuliani, told an MEK rally in Paris in 2017. One-time MEK National Liberation Army commander and security chief, Massoud Khodabandeh, who turned against the group in the second half of the 1990s, says that "I personally have brought money and gold from Saudi Arabia to Iraq for the Mujahideen… It was three trucks of gold… I would say about a ton each." Dutch media reports suggested last week that an Iranian exile killed in Amsterdam in 2015 was an MEK operative who had been sentenced to death in Iran for bombing a gathering of officials in Tehran in 1981. Heightened tension in Balochistan could threaten China’s $50 billion-plus infrastructure and energy investment in the China Pakistan Economic Corridor (CPEC), a crown jewel of the People’s Republic’s Belt and Road initiative. So far, China is in good company with much of the international community opposed to the abrogation of the Iranian nuclear agreement and, at least in the word, determined to defeat US efforts to bring Iran to its knees with sanctions. This article was first published at The Turbulent World of Middle East Soccer blog on May 30, 2018, and is republished on IndraStra.com with author's permission. All Rights Reserved by the Author.